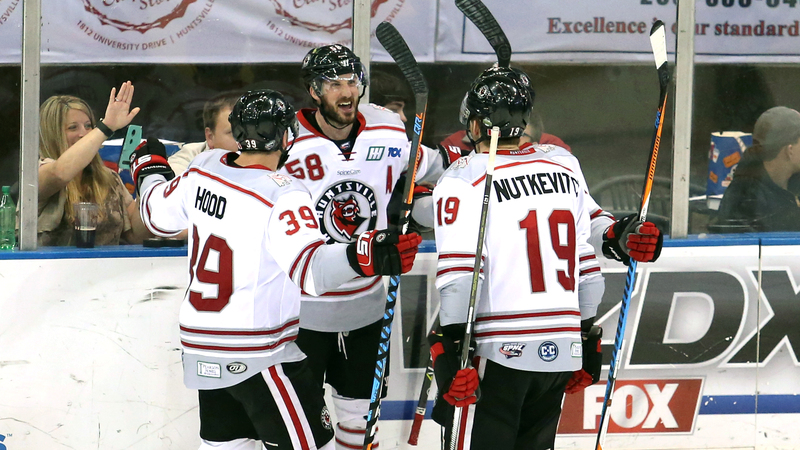 "The guys showed a lot of character and heart, coming back after being down in the series," said Havoc Head Coach Glenn Detulleo. "We're going to enjoy this tonight. Tomorrow, the focus shifts to Macon with the chance to move to the finals." The Havoc lost game one on Friday before coming back to win two straight to survive the inaugural Challenge Round. Havoc Sy Nutkevitch began another stellar night by stealing the puck from Mississippi's Mark Whiteley 13 minutes into the first period, skating in for a one-on-one against RiverKings keeper Tyler Green. Nutkevitch got Green to over-commit, moving around the netminder and giving Huntsville an easy 1-0 lead at the break. Nutkevtich would assist on three more goals before the final buzzer. In the second period, Huntsville's Dylan Hood wrister a shot under Green's glove, followed by a thunderous unassisted shot by Nolan Kaiser that trickled past the goalie and into the net. Tyler Piacentini scored Huntsville's third goal in five minutes, cleaning up a rebound from the slot. The Havoc went to the second intermission with the game well in hand 4-0. Mississippi's Donald Olivieri spoiled the shutout bid eight minutes into the third period when he scored during a Havoc powerplay, but Christian Powers returned the favor four minutes later, netting his third goal in as many nights. While the statistics showed Havoc keeper Mike DeLaVergne with only 20 saves, many of them were acrobatic and against blistering shots from the RiverKings. He even turned away a penalty shot from Mississippi's Devin Mantha with a little over five minutes to go in regulation. A diving Derek Sutliffe put one around DeLaVergne late in the third period, but the damage was already done as Huntsville clamped down on Mississippi, eliminating them from the playoffs for the second straight year. While neither team could muster a powerplay score – despite nine opportunities for the Havoc – both sides did score a shorthanded goal during the game. The video highlights of tonight's game can be found on the Huntsville Havoc YouTube channel. The Macon Mayhem won their three-game series against the Evansville Thunderbolts on Sunday evening, which means they will host the Havoc for the SPHL semifinal round. Game one will be at the Huntsville IcePlex on Wednesday, April 18, at 7 p.m. CDT. (The Von Braun Center arena is not available this coming week.) Tickets are available at the IcePlex office, not at the VBC or Havoc office, and go on sale Monday, April 16, at noon. The IcePlex will not accept orders over the phone – tickets must be purchased in person. Game two and, if necessary, game three will be played at the Macon Centreplex in Georgia on Thursday and Friday, April 17 and 18. Tickets are available by calling the Centreplex at 478-751-9232 or at ticketmaster.com. Fans can find the latest news and notes on the Huntsville Havoc by downloading the official Havoc app powered by Simple Helix for iOS or Android here. You can also earn Havoc rewards points to a variety of Havoc merchandise or experiences.